Arlene Strom, vice president, sustainability and communications, and Chief Robert Joseph, co-founder of Reconciliation Canada, engage in a conversation about strengthening relationships with Aboriginal Peoples and communities. The 2017 Report on Sustainability also provides an update on the new sustainability goals we announced in 2016: strengthening our relationships with Aboriginal Peoples and reducing our greenhouse gas (GHG) emissions. We took a strong step towards our first goal by signing historic equity partnerships with the Fort McKay First Nation and the Mikisew Cree First Nation through which these Nations will become equity partners in the East Tank Farm development when the agreements are finalized. During the year, Suncor also made progress towards its second goal. We identified high opportunity areas for GHG intensity reductions from across the business. Some of these potential initiatives include reviewing opportunities to switch to lower carbon fuels, the implementation of strategic technology to reduce extraction and upgrading emissions and investments in low carbon power such as cogeneration and renewables. Suncor co-founded Evok Innovations, along with the BC Cleantech CEO Alliance and Cenovus Energy Inc. Evok brings together British Columbia's cleantech industry and Alberta's oil and gas sector to accelerate early-stage technologies. Evok has funded six technology companies since its inception in January 2016. The report also shares our community investment strategy through our private, non-profit, charitable organization, the Suncor Energy Foundation (SEF). As stewards of valuable natural resources, we have the opportunity – and responsibility – to help build a better future. By supporting resilience, skill development and social well-being in the communities around us, we strive to create shared value and benefit for all involved. 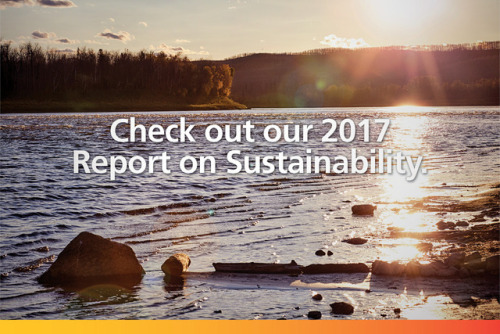 For more about all of Suncor's sustainability efforts, please check out the full Suncor 2017 Report on Sustainability.